There are many views regarding indications for ACL Reconstructive Surgery such as age, activity/demand level and degree of instability. Most individuals, especially moderate to high demand athletes, regardless of age, who have a complete tear of their anterior cruciate ligament, as well as clinical and functional evidence of instability, are candidates for ACL Reconstructive Surgery. When considering the pediatric or adolescent population, there has been extensive debate in the literature over the last 10 years. Initially, treatment was consistent with bracing, rehabilitation and activity modifications (cessation of sports); however, due to the noncompliance of this patient population and their persistent knee instability with daily activities, these patients will often have further injury to the chondral and/or meniscal surfaces, resulting in degeneration and functional impairment. Non-surgical treatment in this patient population is not advised. When considering ACL Reconstructive Surgery in pediatric and adolescent patients, age and amount of growth remaining becomes vital, as this may tailor the technique used to reconstruct the child’s knee. The major consideration is the potential risk of injury to the growth plate/physis resulting in growth disturbance before skeletal maturity. One surgical option is a physeal (growth plate) sparing procedure, which is an all-soft tissue technique considered in the younger athletes because of their amount of growth remaining. This procedure is often non-anatomic but does improve functional stability and completely avoids the growth plates. One surgical option is a physeal (growth plate) sparing procedure, which is an all-soft tissue technique considered in the younger athletes because of their amount of growth remaining. This procedure is often non-anatomic, but does improve functional stability and completely avoids the growth plates. Another physeal sparing technique in this age group describes the use of drilling superficial bone tunnels within the epiphysis. 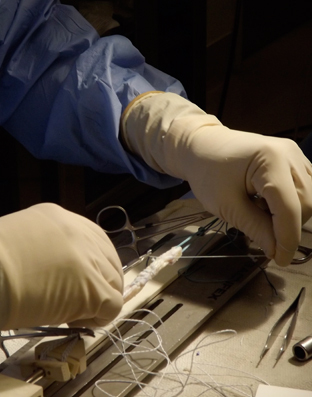 With the use of fluoroscopic guidance during arthroscopy, this technique, secures the graft in a relative anatomic position, but still avoids the growth plates. In a slightly older child, since most of the growth comes from the femur, one may consider a partial transphyseal approach. In this procedure, the graft is brought through a transtibial (physeal) tunnel and is fixed to the femur in a near anatomic position avoiding the physis. A surgeon will often use an all-soft-tissue graft and fix the graft away from the femoral and tibial growth plates, thus, avoiding growth disturbances. Transphyseal anatomic ACL Reconstructions is considered in adolescents and adults, as well as those children who have minimal growth left. This allows for anatomic graft placement by creating tunnels at the native origin and insertion sites of the original ACL. With this arthroscopic technique the surgeon drills through the growth plates and depending upon the age of the patient, one may consider soft tissue (hamstring) graft or bone patella tendon bone graft to reconstruct the ACL. The type of tissue used and fixation technique will depend upon the patient’s skeletal maturity and growth remaining. My gold standard for skeletally mature teenage athletes and young adults is bone-patella tendon-bone autograft with intraphyseal fixation. When there is a contraindication to using intraosseous fixation I will use hamstring autograft and fix the graft away from the growth plates. These two techniques provide excellent stability with no growth disturbance. I would advise against the use of cadaveric (allograft) tissue in this younger population as there is a higher incidence of graft failure with return to high demand sports. There are few indications where non-surgical treatment is advised. First is in the low demand sedentary individual who doesn’t describe functional instability in their day-to-day activities. Next is the young athlete who sustains a partial injury to the ACL but still presents with good clinical stability. In these patients I closely monitor and follow their progress and often advise for the use of a custom de-rotational brace when returning to their sport. The last patient is that patient who is unable, for medical reasons, to pursue surgery because of the potential inherent risks of anesthesia. For these patients, I will often advise a physical therapy program, bracing and activity modifications.